The SC3000 is the most popular product in our Quick build product line. Available with or without a floor for maximum versatility, the SC3000 can be custom ordered with a number of options to suit the user’s needs. This makes the SC3000 the envy of the container world. Sizes available are 7′x7′, 7′x10′, 7′x13′, and 7′x16′ long. Minimum orders on some sizes are required. The one piece floor is made of .75″ (18 mm) OSB. Container’s doorway measures 61″x75.6″ (1550mm x 1890mm), when double wing door is fully opened. Other door options are available. 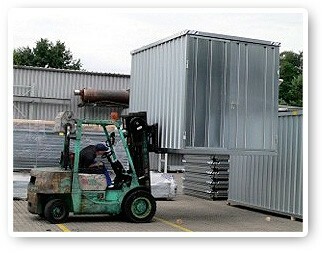 Fully assembled containers can be lifted by crane or fork-lift. There are 4 special fitted jack rings for attachment by crane. The corners are made of structural galvanized steel. Floor load up to 500 kg/square meter (110 lbs/square foot). Total permitted load weight 3000 kg (6600 lbs). Snow load up to 210 kg/square meter (50 lbs/square foot). Roof surface can be reinforced to increase the load to 300 kg/square meter (66 lbs/square foot). Security Bar to cover door. Assembles in about 10 minutes with 2 people; saving time and money. Interlocking system: no screws or drilling. 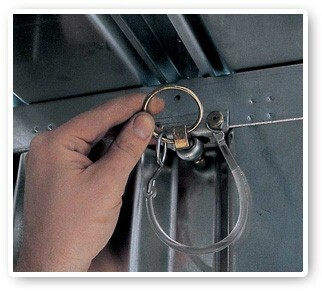 Quick-lock fasteners: simple slide in and the roof is secure. 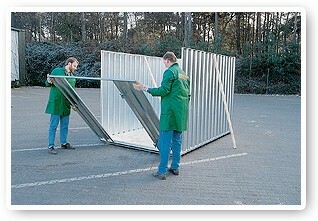 Flat-packed delivery, saves freight charges. Or, Delivered pre-assembled, ready for use. The SC6000 is the work horse of our Quick build product line. The especially tough container is designed for heavy loads up to 6 tons and is perfect for commercial contractors. Total permitted load weight 6000 kg (13,200 lbs). Windows (with or without shutters). Assembles in about 10 minutes with 2 people which saves time and money. Delivered pre-assembled, ready for use.